April 1 is not a joke for people in Hong Kong. For the past 15 years it has been a day of mourning the loss of Cantopop singer and actor Leslie Cheung Kwok-wing. 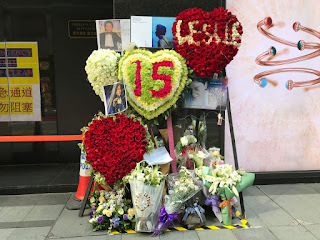 Every year a plethora of flower arrangements are left by fans at the corner of the Mandarin Oriental where he fell to his death. Since it was Easter weekend it was nice that the roads were blocked off around the hotel so that passers-by like myself could take a closer look without having to worry about oncoming traffic. People remember Cheung for being down-to-earth, true to himself (near the end) and so talented. They give him the nickname "gor gor" or "older brother" as a term of endearment and also as someone they looked up to. It's hard to believe it's already been 15 years and yet the outpouring of remembrance is still going strong. The amount of flowers and messages dedicated to him doesn't seem to have decreased much over the years. 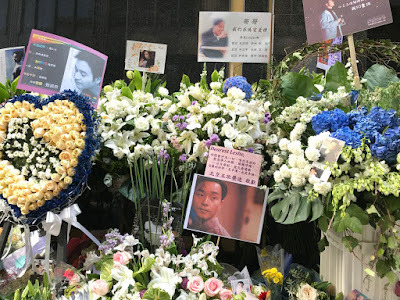 I pretty much always think of Leslie Cheung whenever I pass by the Mandarin Oriental. Happily, I also think of Leslie (and my favorite of his films, "He's a Woman, She's a Man") whenever I pass by or go to the Fringe Club (where a number of scenes in that movie were shot). And, yes, I always think of Leslie on April 1st, and play a couple of his CDs in fond memory.